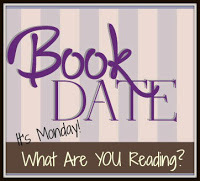 Book By Book: It's Monday 5/22! What Are You Reading? It will be a busy week here, with my two sons finishing their last final exams and moving back home, but then they're headed out to help their grandparents get their sailboat in the water for the season, so my husband and I will have a very quiet holiday weekend to ourselves. I hope to read a lot! 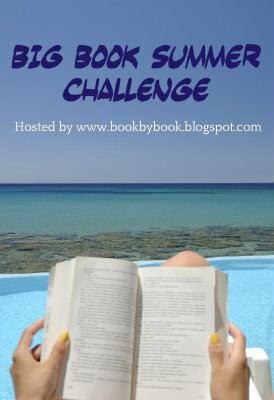 And, remember, Memorial Day weekend (end of May) means...the start of my Big Book Summer Challenge! Watch for a kick-off post on Friday, and in the meantime, do what my husband and I did this weekend, and look through your bookshelves or your want-to-read list for any book longer than 400 pages. I have my stack all ready to post on Friday! I finished The Handmaid's Tale by Margaret Atwood. I bought this book at least 5 years ago and have been meaning to read it ever since. I'm glad my book group finally gave me the push to move it up the list! It was just as amazing and powerful as I'd heard, and we had an excellent discussion. We all agreed it was especially chilling given what's been going on in the world today. Hard to believe she wrote it in the 1980's! Now, I really want to see the new TV show on Hulu, but we don't subscribe to it. I started my next book group pick for this Wednesday, The Journey of Crazy Horse: A Lakota History by Joseph M. Marshall III, a nonfiction book. I'm only about halfway, so I hope I finish in time. It's interesting so far, especially since we have family in South Dakota in the Black Hills region and visit the area frequently, but it's kind of slow-going. I don't normally read much nonfiction. I finished listening to The Hate U Give by Angie Thomas on audio. It's a YA novel about a black teen girl whose friend dies in front of her after being shot by a white police officer. It was absolutely incredible - powerful and compelling. Listening to it on audio was particularly moving - Starr and her family and friends felt like real people, and I could feel their pain and their indecision about whether to move out of the neighborhood. I tried to go back to The Good Liar by Nicholas Searle to finish it, I really did. My husband and I started this audio back in April on our road trip, but what is billed as a"superb thriller and a truly engrossing read" wasn't either one for us. I tried to go back to it last week, but I found it was still a real slog and just not interesting. I gave up officially at about the halfway point and deleted it from my iPod! I needed something completely different, so now I am listening to a YA novel on audio, The Baby by Lisa Drakeford, about a teen girl who unexpectedly gives birth on the bathroom floor at a party. It starts as one of those stories you hear in the news once in a while about a young woman who didn't even realize she was pregnant, but it's quite in-depth emotionally and tells the story from five different points of view. It's good so far and kept me riveted driving through the rain today while my son slept! My husband. Ken, finished a novel I put in his Easter basket: The Bone Orchard by Paul Doiron. When I heard this mystery series is about an ex-game warden in Maine, I knew he'd like it (we both love the outdoors and Maine!). He's says it was very good, and he'd like to read more books in the series. Ken is now reading Little Green by Walter Mosley, one of his Easy Rawlins mysteries. I got Ken hooked on Mosley after I read one of his novels for our All-County Reads program a few years ago. He's enjoying this one. Jamie, 22, finished Battlefield Earth by L. Ron Hubbard last night, a chunkster at over 1000 pages! He read it in one week. To say he is an avid reader is a significant understatement! Jamie turned to some comfort reading today, since he isn't feeling well. Looking through all the books in his room, he realized he never read the last book (that would be #6, I think) in the middle-grade Tunnels series by Roderick Gordon, so he is re-reading the entire series! It won't take him long; he is already almost through the 500-page first book, Tunnels, after reading in the car today. He laughed when I told him about my Big Book Summer Challenge - he said he never reads books shorter than 400 pages! Movie Monday: Arrival - an amazing sci fi film as much about humans as about aliens - a must-see! TV Tuesday: Coming Up in Summer 2017 - the shows we can't wait to come back and a few new ones we are looking forward to. Fiction Review: Lillian Boxfish Takes a Walk by Katherine Rooney - a captivating journey through an elderly woman's long life in NYC. Nonfiction Review: Books for Living by Will Schwalbe - warm, witty, thoughtful essays on lessons learned from books. Saturday Snapshot: National Parks in California & Southern Oregon - last of my NP series. Coming up this week on the blog: My summary of Booktopia, the kick-off for the Big Book Summer Challenge (this link is to last year's page in case you want to get ready! ), and of course, more book, TV, and movie reviews! You and I think exactly the same about The Hate U Give. My English teacher friend who has been right in the past, says it will win the Printz Award. I hope so. You asked me why I abandoned The Girls From Ames. My answer is threefold. 1. It is the end of the school year and every year my reading falls off now until mid to late June when I get into summer mode. I just ran out of time to read it before book club, so I ditched it. 2. The book is part of a book kit from the library, so I had no choice but to hand it over even though I wasn't done. And 3. (and this is the psychological reason) My mother has a group of about ten gals she has been friends with since high school. They get together every summer and write and call each other all the time. My whole life I have been jealous of my mom and her friends. I don't have a large group like that of friends who have traveled the years with me. When I read that there were eleven friends in The Girls From Ames, it made me think of my mom and her friends and I was not sure I felt like reading a book which made me drag back up those jealous feelings. Immature. I know. But there it is. The Hate U Give sounds very powerful, I have looked at it, but not sure I would have the stomach for it, the news is bad enough!! Despite that horrific event that kicks off the novel, it is not all dark - the characters and their families and friends are fully-realized and live normal lives and all of that is shown, alongside the tragedy. Mostly, it is very enlightening. I read the Handmaid's Tale when it first came out and remembering it was wonderful. I feel like I should re-read/skim it since it's become such a hot book right now. This was my first time reading it! And yes, it is REALLY hot right now...our library had a wait list of 55 when I checked for a friend!